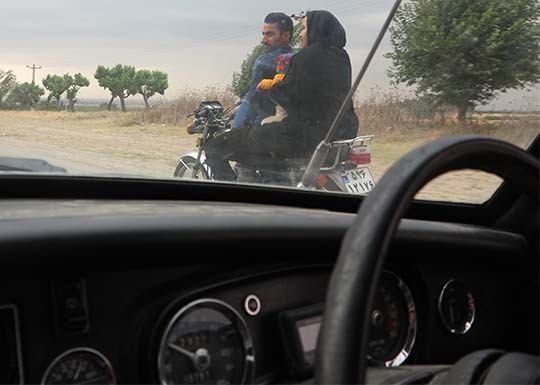 I’m now in Turkey on Day 88 of my Silk Road with an old British sports car journey and I’ve just posted on how friendly the Iranians were on my trip across that intriguing country, with my daughter Tashi often at the wheel. ◄ And shopping for bread when we stopped in the small town of Bojnurd. 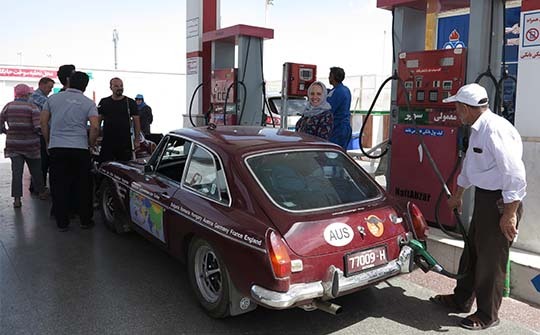 ▲ Refuelling Burgundy, my MGB, in Iran. At about 37c a litre US for 95 octane it wasn’t quite the cheapest fuel on the trip, that honour went to Turkmenistan where fuel clocked up at 29c US a litre. Now we’re in Turkey and paying about US$1.40 a litre. ▲ Passing a couple on a motorcycle, note the baby squeezed between them. ▲ In Rasht on the Caspian Sea coast the cars got their second oil change and service of the trip, the first time after about 10,000km from Bangkok to Shanghai and then a further 11,000km for this second check up. 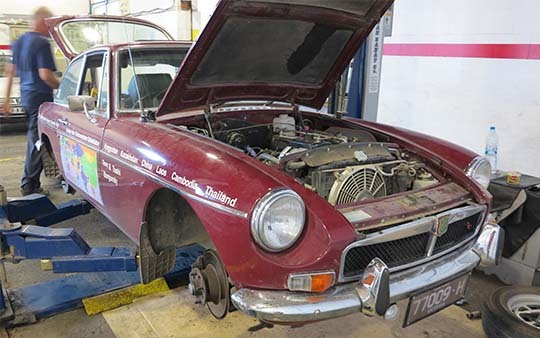 On both occasions we were able to use the service facilities and mechanics’ assistance of the cities’ MG dealer, modern MG cars are now made in China. ▲ Along the way lots of people have asked to take a seat in Burgundy for a photo op. 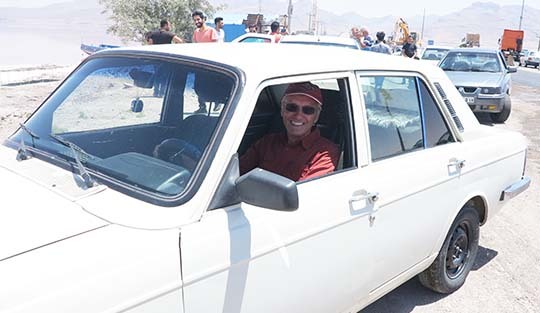 On this occasion in Iran I swapped the roles and tried the driver’s seat of a Paykan. My first job as an engineer when I graduated from Warwick University way back in 1968 was with the Rootes Group, soon to become Chrysler UK and then to go bankrupt. The Hillman Hunter, recently released at that time, was code named ‘Arrow’ during its development and that’s what Paykan means in Persian. 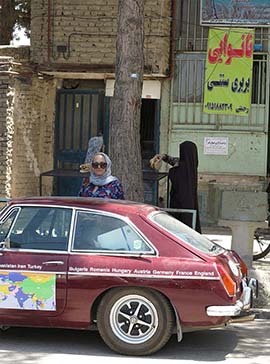 Hillman Hunters were initially sold to the Iranians in CKD (‘completely knocked down’) form and when production of the Hunter ended in England in 1979 the whole assembly line was sold to Iran. When production of the Paykan finally ground to a halt in 2005 over two million cars had been produced. 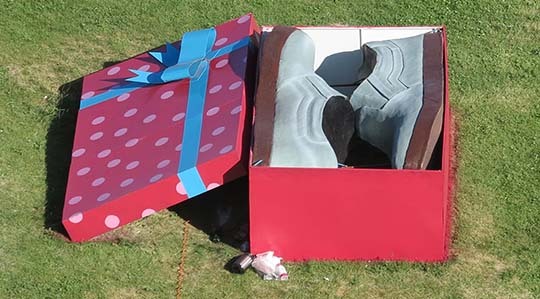 ▲ The Iranians are very fond of urban sculptures, decorating many roundabouts, road junctions or, in the case of this giant pair of boxed shoes in Urmia (also known as Orumiyeh) a road underpass.